This book argues that increasing engagement between international institutions and sectors of civil society is producing a new form of global governance. 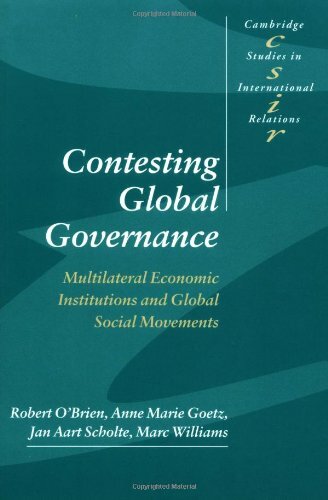 The authors investigate 'complex multilateralism' by studying the relationship between three multilateral economic institutions (the IMF, World Bank, and World Trade Organization), and three global social movements (environmental, labour and women's movements). 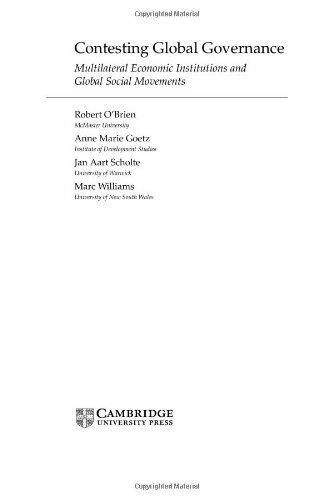 They provide a rich comparative analysis of the institutional response to social movement pressure, tracing institutional change, policy modification and social movement tactics as they struggle to influence the rules and practices governing trade, finance and development regimes. The contest to shape global governance is increasingly being conducted upon a number of levels and amongst a diverse set of actors. Analysing a unique breadth of institutions and movements, this book charts an important part of that contest. This book argues that increasing engagement between international institutions and global social movements is producing a new form of international organisation. The authors provide a rich analysis of the relationship between the IMF, World Bank, and World Trade Organization, and environmental, labour and women's movements.